This chapter examines the potential to use an audit program based on the Control Objectives for Information and related Technologies (COBlT) frameworkfor IT audit within a public sector audit office. 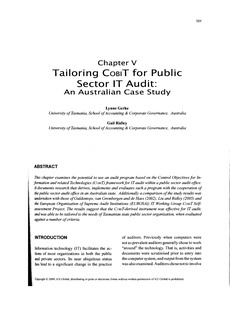 It documents research that derives, implements and evaluates such a program with the cooperation of the public sector audit office in an Australian state. Additionally a comparison ofthe study results was undertaken with those of Gulden tops, van Grembergen and de Haes (2002), Liu and Ridley (2005) and the European Organisation of Supreme Audit Institutions (EUROSAI) IT Working Group COBlT Self-assessment Project. The results suggest that the COBIT-derived instrument was effective for IT audit, and was able to be tailored to the needs of Tasmanian state public sector organization, when evaluated against a number of criteria.